"I grill anything and just tried this recipe one night for a change. Works great on your indoor plug-in, lean-mean grill also. These are great with a wasabi dipping sauce (half wasabi paste and half sour cream)." Brush butter over Brussels sprouts and season with garlic powder, black pepper, and seasoned salt. 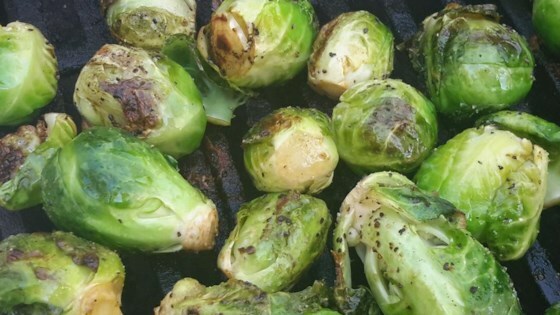 Place sprouts on the preheated grill and cook until tender and grill marks appear, about 10 minutes. Squeeze lime juice over sprouts before removing from grill. We loved this! I didn't cut the smaller ones in half. Brushed with olive oil instead of butter, but drizzled a little butter on them when done. Freshly ground sea salt is good on these, too! I think grilling just makes everything taste better. This rates up there with the best in Brussel sprouts. I added some freshly grated Parmesan Cheese after taking them off the grill. Yummy!!!! I will make them again. I made this for Easter and was a huge success. I had a lime but forgot to use it. Dang. Everyone also loved the wasabi sauce.